Turkish Court Cans 50 Giant Fans so residents can sleep, at long last. And, now the Turks. As this article lays out – in terms so simple, that even tobacco advertising gurus should be capable of understanding them. 50 operating wind turbines stopped by the court! The Administrative Court in Ankara has ruled that fifty operating wind turbines in Karaburun be stopped. The locals of Yaylaköy, Karaburun are delighted with the court decision. It is 20 days since the wind turbines stopped working. From the beginning of the struggle to protect their village from the adverse affects from the Wind Power Plants that are spreading all over the peninsula, the local people have finally received good news. The Administrative Court, ruled in April that even if fifty wind turbines are already operating, the activities have to be halted since the environmental damage is irreversible. First an EIA report will have to be issued. The wind turbine company’s request to continue to run their turbines meanwhile, was also denied by the court. The lawyer Cem Altiparmak said the decision would be a first in the country. Mr. Altiparmak states that there are very few court cases related to renewable energy. In this area the law is insufficient, there are no precedents, so we have to live it to get experience. “A number of license revocation proceedings have started in our country. Our court ruling is one of the first and will have an impact on up-coming cases. İzmir Governorship Provincial Directorate of Environment and Urban Development, had issued a “EIA Not Required” to install 166 MW in the Karaburun Peninsula. 8 years later when EMRA issued a new license for another 50 turbines to the same company leaning on the same “EIA Not Required” document, the residents of Yaylaköy and the environmental movement Karaburun City Council sued EMRA – The Energy Market Regulatory Authority. The court ruled that this is against the law and if allowed to operate the damages will irreversible therefore all operations have to be stopped until an EIA investigation has been performed. The court decision has given hope to the local people as well as other people in Cesme, Bodrum, Datca and Urla where wind turbines projects are being planned without any public consultation. All these projects have been issued with an EIA Not Required”. Hopefully this Wind turbine project will not be able to operate again and for the first time in years the people in Yaylaköy are able to sleep comfortably and we will continue to work for that, says one man from the village. The Independent reported on 25 May 2015 that the Labour Party parliamentary party will this week debate proposals to introduce new restrictions on the development of wind turbines close to people’s homes. Apparently Labour TDs and senators are demanding changes in “set-back distances” and the introduction of a cap on the size of turbines. There are two things very wrong with this statement. Firstly, 200 extra metres will not make any difference at all to the nearby residents’ health and quality of life. Secondly, the debate on setback distances conveniently avoids the more important debate as to whether we need wind farms at all, given the dramatic over-supply of these monsters already, and the undue emphasis placed on wind-energy to the detriment of other renewable energy sources. Minister Kelly, enough of this nonsense. When the 2006 Guidelines were published, recommending a setback distance of 500m, wind turbine heights were on average 54m tall. The turbines being used in Ireland are at least 3.5 times as high, some 185m tall. 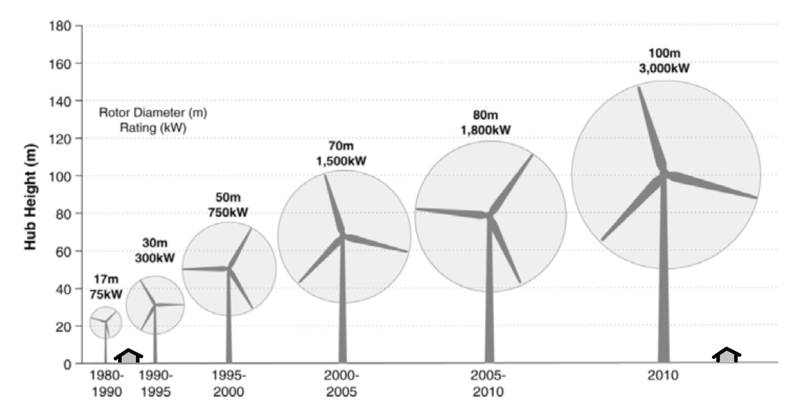 This graphic from Harvard University shows how wind turbines have grown over the years. That graphic is now five years out of date, with industrial turbines growing even larger in the interim period – the maximum height shown here of 100m has almost doubled in the last five years. Accordingly, at the moment we should be talking about a minimum set-back distance of 1.5 km to obviate the health dangers of noise. The proposed 700 m is still less than half this minimum distance. When taking into account the flicker effect, a minimum set-back distance of 3.00 km seems reasonable. When one considers how wind turbines are continuously increasing in size and power, it might be prudent to talk about a distance of 5.00 km? Given how long it takes to amend these guidelines, perhaps we should plan for the future? Or an even better idea, why not stop building them? The Labour Party wonders why it has zero-credibility with the Irish public. When they pull stunts like this, I am surprised at their surprise.